To get started with your introduction to CrossFit Twin Cities, please fill out the form below. The community that spontaneously arises when people do these workouts together is a key component of why CrossFit is so effective, and it gave birth to a global network of CrossFit affiliates that number over 11,000. Harnessing the natural camaraderie, competition, and fun of sport or game yields an intensity that cannot be matched by other means. We offer a wide range of membership options to suit your personal needs. Join us for a FREE 1-on-1 Intro Session and we can do a comprehensive review to discuss the best choice for you. I'm new to CrossFit. What can I expect? If you’re trying CrossFit for the first time, join us for a FREE Intro Session! During your introductory phase, and as long as you’re a member of CrossFit Twin Cities, we’ll make sure you can execute movements soundly and efficiently as we cover foundational movements and guide you through your progression. Start with our 1-on-1 Fundamentals program where you’ll master the basic movements, and as you demonstrate proficiency, we’ll add on appropriate intensity and complexity. Your coach is always with you to make sure every workout is tailored appropriately to your level, and the supportive community will always be your biggest cheerleaders. Absolutely not! With experienced coaches who emphasize form and proper movement (versus just “grinding out” a workout with disregard for each person’s ability and current work capacity), we provide an effective workout that’s SAFE. In working to achieve virtuosity [(n): great technical skill] you will be challenged in ways that gets you results properly. Don’t worry, you’ll still sweat plenty and get in a good workout every time. Our coaches are trained to know when you can push a little further, and when we need to dial it back, so we encourage you to always keep a running dialogue with us before, during and after each workout. 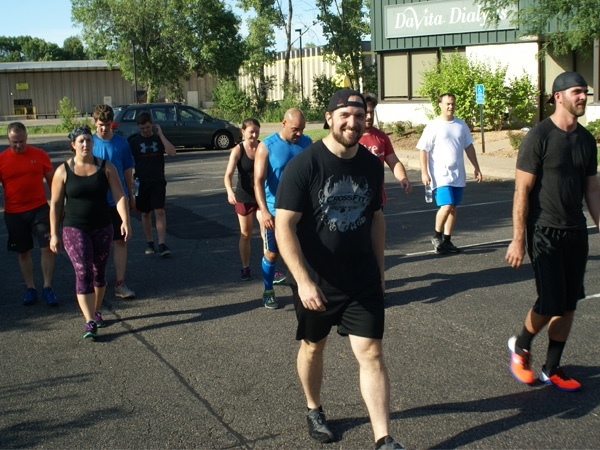 Experienced CrossFitters and athletes are always welcome to drop into our classes! Our daily rate is $20 or $50 for a 1-week pass. Yes! We understand group training isn’t for everyone, and we strive to accommodate our member’s special needs, circumstances, goals, and schedules. Click here to learn more! Have fun getting fit with amazing people, great music, and experienced trainers in the best training facility around.